- Outline lips with lip liner of you choice about 1/4 inches from the outside of your lips toward the center. Then use a lip brush to blend the salve to achieve a "pouty look". - Use Rosebud Salve alone or over your favorite hue of lipstick to moisturize and give a "dewy effect". 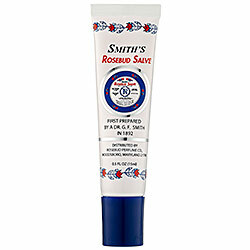 - Apply Rosebud Salve to eyebrows to tame an unruly brow line while also giving sheen. - Rosebud Salve is great on fly-away or frizzy hair. Dab a small amount on the palms of your hands and apply sparingly to tresses. - Use Rosebud Salve as a subtle accent to cheek bones, collar bones, shoulders, or any other body part that you want to moisturize or enhance. - Apply rosebud Salve lightly to the skin above the eye as a base for powered eye shadow, and then add the desired colors you wish to dazzle your eyes with. The rich emollient properties of the Salve will help to hold that look all day. What I Like- PERFORMANCE: 我咀唇常常脫皮,唇紋也有點多, 一天不用潤唇膏就慘了. 花蕾膏質感偏油潤, 修護能力不錯, 前陣子脫皮脫到流血, 用力地挖, 厚厚的塗, 第二天就好多了. 假如作為唇膏打底, 最好先用紙巾壓一壓, 印走多餘潤唇膏, 然後再用唇膏就比較不油了. - TEXTURE: 在香港冬天不會變太硬, 夏天不會融掉, 這點很得我心. 想當年冬天用過硬的潤唇膏, 明明雙唇已經乾到不行, 還被硬過石頭的潤唇膏折騰, 很想把它丟掉. - CITYSUPER: 提醒一下大家, 要到有信譽的代理商/購買, 雖然比較貴 (我在美國sephora 買, 只要香港一半價錢耶), 因為偉大的祖國充斥花蕾膏假貨, 用上嘴巴的或多或少會吃進肚子, 小心至上啊! 雖然不至於說是最好用的潤唇膏, 但總結來說我蠻喜歡它. 看起來顏色很紅, 擦上嘴巴就沒什麼顏色, 很淡很淡. 同公司也有不同口味的花蕾膏, 例如士多啤梨, 薄荷等等, 但這罐用了差不多一年才挖了一半, 所以還沒有機會試到其他.